Twitter & the doing of good. I've blogged about this before but wanted to bring it up again. The Boston Globe has done something interesting, they created a twitter account for Do Good Boston. Now when a new event, volunteering opporuntity, or in-kind donation need is added to Do Good Boston, it's automatically tweeted. Pretty cool. If you're from Boston and want to keep up with good things, really good things, to do, make sure that you follow @GlobeDoGood. Interesting from USA Today – Save 5,000 unwanted pets. Love this – check out Pilots N Paws' Lofty goal: Save 5,000 unwanted pets from USA Today. How I spent my Sunday morning. I was poking around Do Good USA today the other day and found this – Habitat for Humanity Greater Boston needed folks to help collect stuff and pack it up at the Boston Home Show. I'm something of a trade show freak – I love them – so it sounded like a ton of fun. 7AM Sunday morning I was at the Boston Convention & Expo Center, bright eyed & bushy-tailed, and spent the morning collecting and packing building materials donated by the exhibitors at the show. It was terrific working with the Habitat folks and all the great volunteers. And Do Good channels are helping local nonprofits! "We have definitely noticed an increase in donations. These donations are vital for the youth at our Center. Thank you and your readers so much for your support!" If you're in the Nashville area, you should check out Monroe Harding – they do great stuff and they could use your help. They have upcoming events - Laughter for the Children and Laughter for the Children Patron's Party – and they need in-kind donations - Hygiene Items and Household Items Needed. Great organization doing great stuff in their community. Our friends at LoHud.com wrote about good2gether and Do Good Westchester County. Nice write-up. Read the whole thing here. Habit for Humanity Greater Boston needs 100 volunteers this Saturday (8/22). Check it out. Help 'em out. The newest member of the Do Good team! The newest member of the Do Good team!, originally uploaded by Middlesex Fells. good2gether West just sent us this picture of the newest - and most beautiful! - member of the good2gether Do Good team. Congrats to Kris and Tom! We welcome...the American Cancer Society! All in 1 fell swoop. We worked with our friends at ACS to move over their current fundraising events to our Do Good channels. Mission accomplished. They transferred the data to us. We uploaded it. And now we're featuring it in our connect2cause widgets and Do Good channels. For instance, take a look at Sharing at USA Today. Notice what's featured in the connect2cause widget - Go: Making Strides walk - Fort Myers, FL. Or, take a look at Do Good Fort Myers. 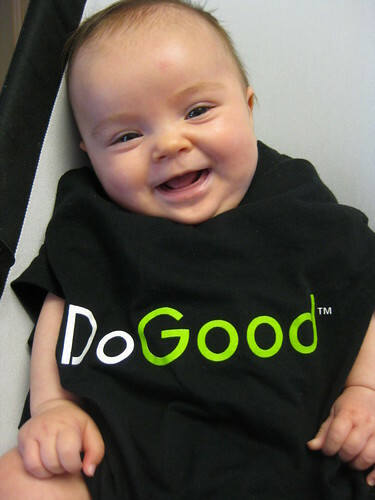 What's featured on the home page of the Do Good channel? American Cancer Society, Fort Myers, FL. And take a look - they have four upcoming events listed. The American Cancer Society does a great job of aggregating every local fundraising event so that they can be found at the national website. We're just a terrific distribution channel for them - move their stuff over and more people can find it and then share it with others. For other national organizations who perhaps don't do as a great a job of aggregating their local events, we can help too - we can help aggregate the local fundraising events and then transfer it back to national or give them their own Do Good channel. No matter which way a nonprofit wants to use us, we can help connect their needs to more people…help them get more people involved. Off to New York this morning (8/5) for meetings with Allscope, American Lung Association, Associated Press, Cause Global, and others.